Our friends at Yahoo's Eh Game site have the numbers, and they look pretty good: the 50th Vanier Cup averaged 320,000 viewers on Sportsnet. * This number doesn't include streaming -- either the CIS feed, or Radio-Canada stream or (obviously) illegal ones -- and those figures would bump this number up significantly. NCAA football games in the same time slot averaged 91,000. So, what does 320,000 viewers actually mean for the future? Quick answer: probably nothing. According to the Toronto Star, regular season OUA football averaged 28,000 viewers in the 2013 season. 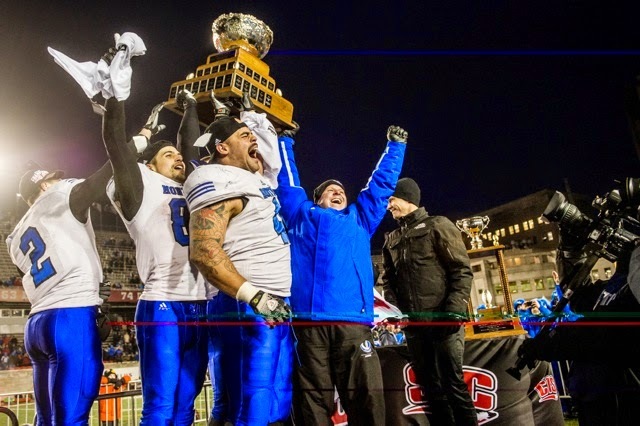 The 2013 Vanier Cup averaged 301,000 viewers. I actually think 320,000 viewers this year is more impressive than it seems. I cannot find the tweet, but Jim Mullin made a good point during the Mitchell Bowl: the lack of weekly television coverage hurts the product and people are unaware of what is going on. Mullin is bang-on here. Dropping a product on viewers, starting with two oddly named games that are confusing in nature, is not the easiest way to draw people into your product. Seriously, the Mitchell/Uteck Bowl make it hard for people to understand what they are watching. Is it a championship or a semi-final? Is it...both? That is a conversation for another day, but a contributing factor nonetheless. To get 269,000 without building the hype for four months is impressive. But I doubt that this figure pushes the needle for Sportsnet. It isn't a large enough number for Rogers brass to say "maybe we made a mistake" and get their ducks in a row to start broadcasting the OUA again. It would be nice I'm wrong, but their stance seems like a firm one: production costs are too high. In that same Toronto Star interview, Sportsnet president Scott Moore said that production costs needs to be closer to "5 to 10 cents." Moore says that "other sports" cost a similar amount. The Sportsnet executive also said that OUA football games cost $3 a viewer. Using that production cost as a similar mark for the Vanier, the per viewer cost was 26 cents. A Vanier Cup production likely costs more than a regular season football game, so the per viewer cost is going to be higher. Regardless, you can see that number is still well-north of what Sportsnet is aiming for. I don't think this changes much. It is good to see the Vanier get support despite the odds stacked against the event, but don't expect to get regular CIS football coverage back on your TV anytime soon. * Correction. When this was originally posted, the number read 269,000 viewers. This number did not account for Sportsnet 360's numbers. Thanks to Chris Black for the assist. Any chance of a post detailing the questionable and often despicable ways the host committee and city treated Mac? Personally, I think there is little-to-no point in retreading a story that has been covered in multiple outlets in a better way. I also think that the way the host committee and city treated Mac was within their own rights, considering Pierre Lafontaine said that rules don't exist. Teams should take every advantage they can get. Even if the decisions made by one team were "questionable" they acted within their rights, so more power to them. As others have said, if the CIS doesn't take themselves seriously, why would anyone else? I didn't realise the Allouettes were in the Vanier Cup. Otherwise the host committee is not the home team and some of the actions, like leaving Mac to shovel the field themselves before they could practice; hotels gouging them on rates and expenses; and deliberately omitting the names of Mac players when announcing all-Canadians are bush league, regardless of the standards of the CIS. When Ottawa hosts it next year I think it will make Montreal's turn look like even more of an amateur show than it already appears.